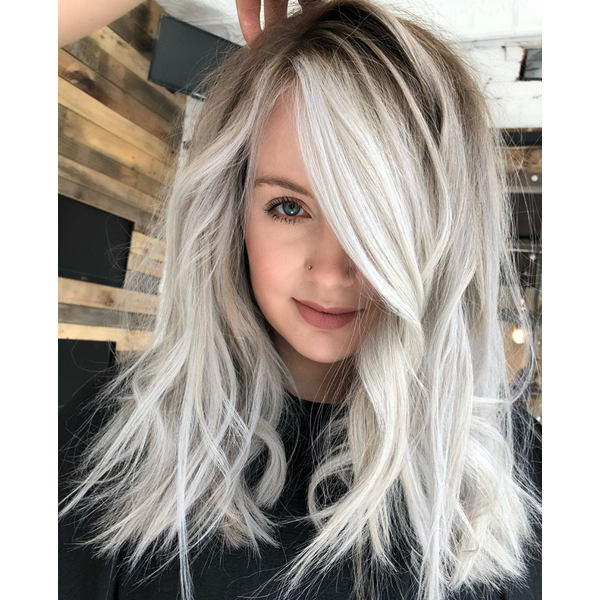 Nothing is more on trend right now than a perfectly-toned platinum coming off a shadow root base, #amirite? So of course we love this updated hue created by Sarayah Politi (@hairbysarayah)! Her secret to platinum + shadow root perfection? Super fine babylights and the right toners—and don’t worry, we’re breaking down the formulas and steps below so you have all the details. Keep scrolling! 1. To start, babylight super fine sections with Formula A. Let process until the hair reaches a pale yellow and then wash out completely. 2. Next, apply Formula B all over, then Formula C at the root and stretch down about 1 inch. Leave on for only 5 to 10 minutes and watch carefully at the bowl. 3. Once color is achieved, rinse, blow-dry and style using a 1-inch iron and texture spray to create lived-in waves. Scroll through the slideshow to see the after shots from different angles.